My opinion of the Superior Spider-Man Annual #2 has revealed an inconvenient truth about myself. I’ve grown tired of and frustrated with the Superior Spider-Man – the character mind you – and April and Peter’s return cannot come soon enough (though if my suspicions are true, the resolution to Spider Ock’s story may last longer than originally anticipated or promised). 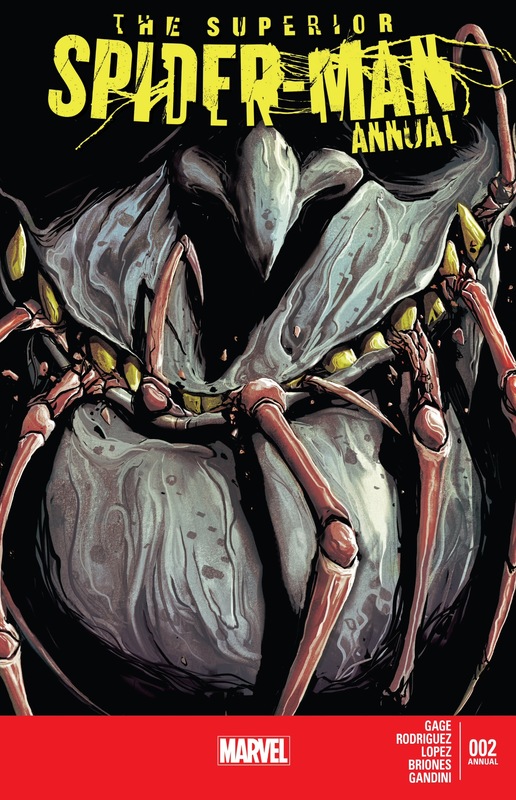 I can now state my opinion about Spider Ock in no uncertain terms because I really enjoyed this latest issue (or at least the first story in it, “Bloodties”). 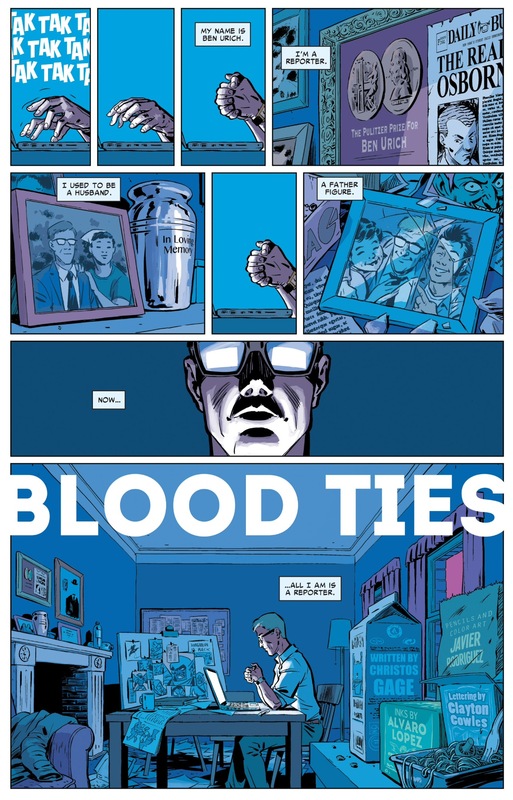 I thought “Bloodties” was the best Superior story since Superior #26 a few months ago. What do Superior Annual #2 and Superior #26 share in common? Each issue featured very little Spider Ock and instead the focus was on Spider-Man’s supporting cast. I’m really past the point of being wishy-washy about my current feelings about Superior. I applaud Dan Slott for taking a huge risk in creating the “Superior” status quo, and for a good while, I sincerely found myself caring about the Spider Ock character, or at the very least, caring about whatever Otto was doing while masquerading around as Spider-Man. But that ship has sailed and while I understand there is still a vocal contingent of the fan base that thinks Otto Octavius as Spider-Man is the greatest thing going in comics, I’m over it. So, so over it. I’ve grown weary of reading about an unlikeable, egomaniacal character that refuses to learn from his mistakes and treats other cast members that I love (coughmaryjanecough) like dirt. And if Marvel is going to give me stories within the Superior Spider-Man series that put the focus on characters that I can identify with and relate to, like Ben Urich or (*gasp*) Peter Parker, then my frustrations with Spider Ock are going to become more pronounced. So go ahead, you can laugh all you want, but I have my philosophy. Yes, I’ll probably keep buying Spider-Man comics, even if Otto sticks around longer than anticipated. I will continue to write about them on this blog, because after doing it for so many years, I feel like I owe it to myself, to you and to Marvel, to always be candid and thoughtful about the world of Spidey comics. When I love something from a Spider-Man comic, I like to think that I make every attempt to convey exactly what I love about it. If I dislike it, I might occasionally sound cranky, but again, I attempt to make my argument intelligently. Since you clicked on this post expecting to read my thoughts on Superior Annual #2, let me actually address that. “Bloodties” is a great, character-driven story, starring one of my favorite supporting cast members in the entire Marvel Universe. As I mentioned in this guest blog I did for Longbox Graveyard, Ben Urich has long been an inspiration for me professionally. As someone who spent the first five years of his post-college life working as a reporter at a daily newspaper, I find Ben to be one of the truest, most realistic characters you can find in a comic book. 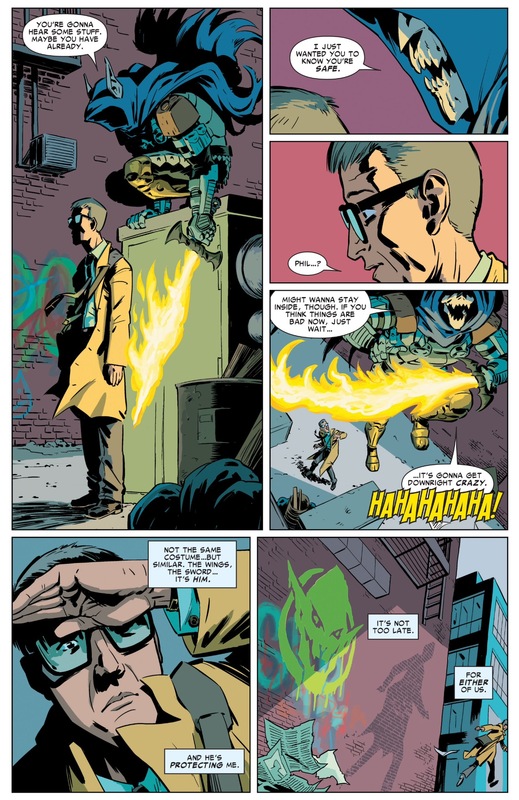 When I opened up Superior Annual #2 and saw the wonderful “My name is Ben Urich. I’m a reporter,” line, I wanted to jump off of the subway train I was on and kiss Christos Gage for unexpectedly giving me the gift of an old-school style Daily Bugle Ben story. 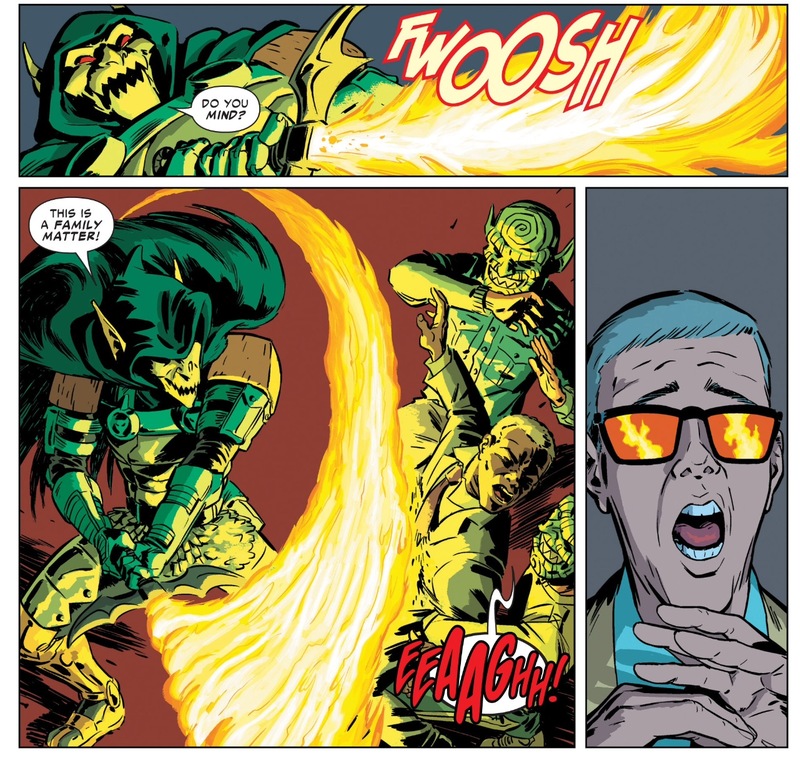 Beyond my love affair for the character, what I really appreciate about Superior Annual #2 is how Gage seamlessly works in the Ben Urich subplot into the larger universe of “Goblin Nation.” Ben’s nephew, Phil is currently playing the role of “Goblin Knight,” a henchman in the Green Goblin’s army. But after the this relationship was acknowledged in Superior #16 last summer, I never thought a creator would come back to the Ben/Phil dynamic before Superior wrapped. Gage (with excellent art from Javier Rodriquez) puts the spotlight on Ben in a time of personal despair. He’s an old soul living in a modern world, and is all alone. His only remaining family is a certifiable lunatic and murderer. In true tragic fashion, Gage provides readers with a moment of hope and then turns around and pulls the rug out from underneath us. While the city is under siege from the Goblins, Phil finds his uncle to make sure he is safe. He laughs maniacally as he flies away, but Ben interprets Phil’s actions as a subtle cry for help. He sets out to get a “cure” for the Goblin Serum, to save Phil. But Ben discovers that Phil’s humanity is fleeting. As Ben makes his attempt to “rescue” his nephw, the Goblins reveal they have a prisoner, Joe “Robbie” Robertson. During the ensuing struggle, Phil slashes Robbie with his flaming sword. Ben’s look of dismayed horror is captured perfectly by Rodriguez. It’s such a heart-wrenching moment, and one we just haven’t had enough of during the “Superior” era because for all of its action, twists and turns, these character-driven moments have been few and far between. For a final gut punch, Gage scripts a scene between Spider Ock and Ben where Otto robotically tells the reporter that if he spots his nephew in the future, his first response should be to call for Spider-Man. It’s a typically tone deaf comment from Spider-Man – why would Marvel’s greatest newspaper reporter instinctively think to call Spider-Man at the first sign of his nephew? But it also functions to drive a stake through the heart of the idea that there’s some kind of redemption out there for Phil. Ben essentially disavows the last bit of a family he has left, and the story ends on a somber note. The second half of Superior Annual #2, “Chasing Ghosts” is more of the garden variety, serving story over character entry I’ve reluctantly come to expect during “Goblin Nation.” There’s nothing abjectly wrong about it, outside of the fact that the focus is exclusively on Slott’s Captain Watanabe Wraith personality – someone I haven’t cared a lick about since she was introduced three years ago. 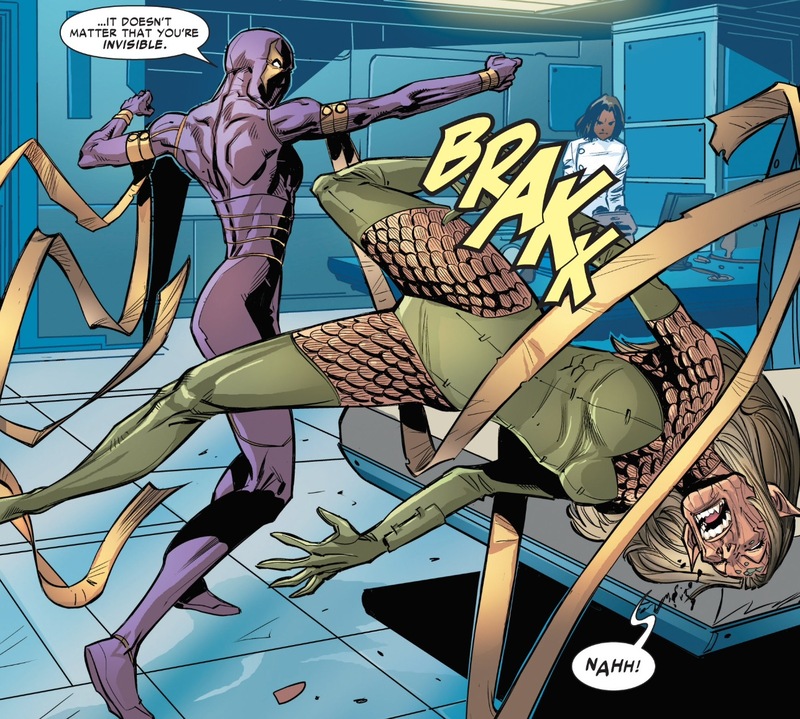 Gage’s script lacks the crispness and depth that we got in “Bloodties,” but we obviously needed the events of this story – Carlie receives an untested cure for the serum which knocks her into a coma of sorts – because they will be used to advance the narrative in the final two issues of Superior Spider-Man. My only hope is that maybe over the course of these next few weeks, Slott will find a way to deliver an understated, character-centric story a la “Bloodties,” but I’m not feeling optimistic. Some of Slott’s finest moments scripting Spider-Man – i.e. the ending of “Spider Island,” and “No One Dies” – came when the writer took a step back and gave us just a little bit less, instead of more, more, more. The Superior Spider-Man has epitomized the best and worst of comic book excesses. Perhaps I’m in the minority, but I find a story about a grizzled reporter and his nephew to be far more compelling than anything with Spider Ock right now. What is Phil Urich eating on the cover? It looks like a crab. I agree – Superior Doc Ock out stayed his welcome many many issues ago. I have zero interest in his redemption and all of Slott’s tricks have failed to convince me otherwise. I just hope when Peter comes back this Superior version isn’t left around to hoover up even more $$. Slott has seriously disappointed with this turn and his stories read like big concepts poorly executed. Time to take him off the books & try someone fresh. 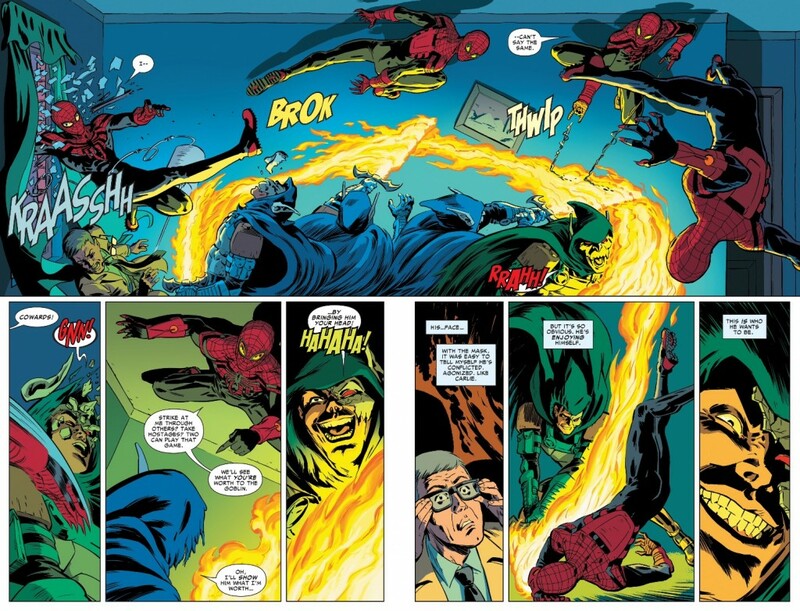 I would love Waid’s retro-daredevil take on Spidey now; it would be awesome. Is it me or is the art sooo messy it’t a chore to read it. ^Waid’s Spider-Man is terrible outside Unscheduled Stop. 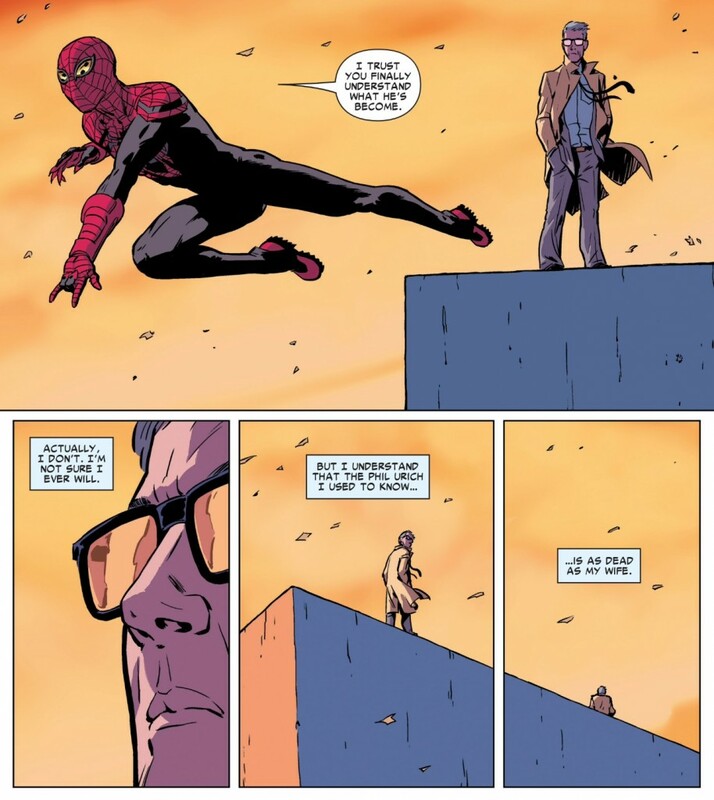 His crossover with Daredevil had Peter Parker whining about his love life, beating up crooks that were happier than he was, coming off like a creepy stalker loser to Black Cat, losing the race down the building to DD, not seeing the illusions and lookin’ like a dumbass, his spidey sense suddenly not working to hear the ground tremors, then grabbing the electric wire and shocking himself. He overplays the “lovable loser” aspect more than just about anybody from the BND era, there’s nothing likable about his Peter Parker. I’d take 10 Spocks over him.